Fix the Flaw, Army Navy Shaw! 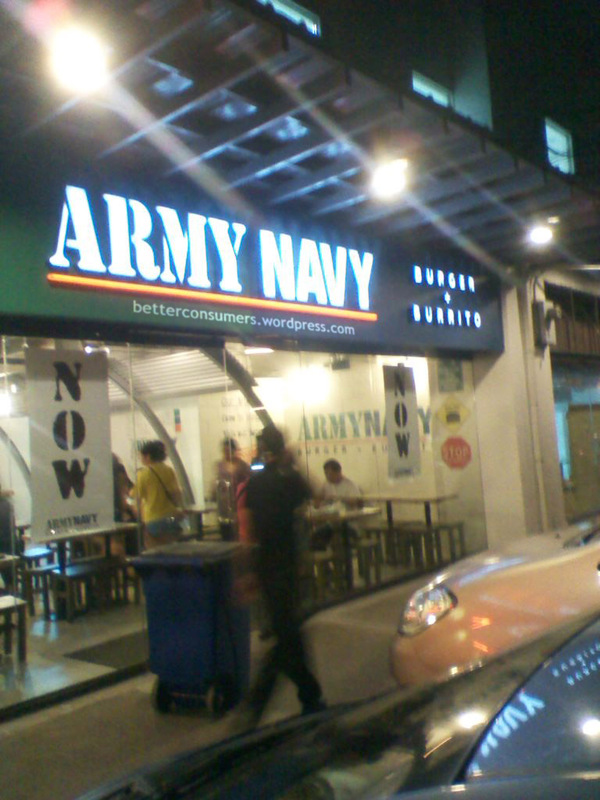 Those around Shaw Boulevard in Mandaluyong City that are huge fans of Burritos and Burgers should look no further because Army Navy is now at your doorstep. I got introduced to this joint last year in Tagaytay, Cavite during Holy Week (2010) and I didn’t enjoy it at first because all our flimsy, disposable plates, utensils, and napkins (and food!) were all being blown away. Aargh! You feel me?! Anyway, I tried it again last Monday (July 11). This time I find the experience fair. For three people who ordered Chicken, Taco, Burrito, three drinks, and two fries, our bill was at Php780.00. I find that steep especially when their burrito is smaller than the Mexican kiosk place in SM Megamall called Hola! (Hola!’s Review) that only cost me Php68.00! As for the food – their fries (with a hint of spicy-ness), the tacos, the ambience are good but our orders were slow. Is it an operations glitch? It took twenty minutes to get our orders on our table. Overall the experience for me is two (out of five) stars. I will only go back there if they will serve something that I feel will be worth my budget. I’ll try to post their menu so you can prepare your budget for it. I’m posting this so those of you who are huge fans of this place can now enjoy it – if you can spare about Php300/complete meal.